In 1997 Alan and Kathryn Bolsover formed dP Doors and Shutters Ltd. from their garage in Sheffield. In the space of 17 years they have moved premises twice as the business expanded. Employing over 40 staff, they now occupy a 12,000 sq foot large modern factory unit located on the Dore House Industrial estate and even that has been extended twice to accommodate this fast growing business. Alan explained that when the business first commenced in 1997, the doors were sourced from a variety of different manufacturers but they soon realized that they could not rely on outsourcing alone to fulfill promised delivery dates to customers, and made the decision to manufacture in house roller shutter doors, fire shutter doors and high-speed doors themselves. With the aid of a European grant, they invested in specialist machinery and experienced people from within the local industrial door industry. Along the way dp Doors and Shutters have been accredited, BS EN ISO 9001:2008 and are full members of CHAS and the Door & Hardware Federation (DHF). They also hold a 4 hour Fire Certification for their own fire shutter. dP Doors and Shutters Ltd. are totally customer focused with contracts that include blue chip companies such as; Tata Steels, Molson Coors, Forgemasters, Moy Park and Rolls Royce in addition to several major building contractors. Alan soon realized the need to offer a separate repair and maintenance service running parallel with the new door installation department but by dedicated engineers. They have put in place a same day call out (usually within 4 hours) to all their contract customers. “To offer that kind of service you need to be in complete control of your workforce. We needed to be efficient and we recognized the importance of implementing a system that could offer time sheets, driver checks, schedule jobs including health and safety, signature capture, manage driver behavior and track the vehicles without impacting on the environment. It was a tall order but after our first meeting with Roger Martin from BigChange Apps we knew this could be achieved. Since implementing the JobWatch system, powered by BigChange, we have speeded up our invoicing process to the extent that we can invoice the customer immediately after the job has been completed”. When a customer calls staff can look on the system and see immediately who is the nearest with the right qualifications to do the job and give an accurate ETA. Each engineer has a BigChange rugged mobile computer, which also enables him or her to perform a series of pre-driving vehicle checks before they get into the vehicle. The jobs are scheduled onto the computer enabling the driver to be navigated to each job. 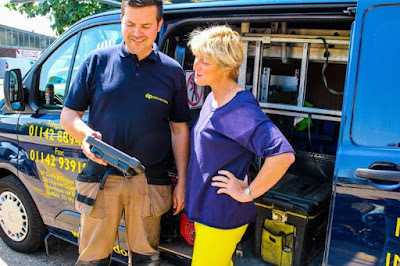 Once on site, if any parts are needed this is captured on the computer along with signatures and any other details. Head office will receive this information and can process it immediately. 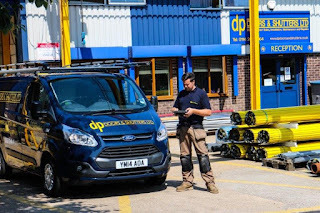 From humble beginnings DP Doors and Shutters Ltd has expanded to become a formidable force in the manufacture, installation and maintenance of a huge range of industrial doors, shutters and grilles to the whole of the UK.